Yule sometimes poses a huge issue for many Pagans out there. Let’s face it, Pagan items are not very easy to find in your local box store, and many items cost more than our budget will allow. Sure you can give candles… but really, you did that last year and the year before. It’s getting a little old. OH! Wait you can give them that cute (not really) poppet you made and didn’t really have a use for it in your treasure trove of supplies. My solution? Make food items. Make foods that toast the season and bring comfort and joy to everyone’s downtime and tables. I started this tradition when we were so poor we could barely pay our electric bill. So I did what I thought was the most thoughtful and budget-friendly thing I could do. 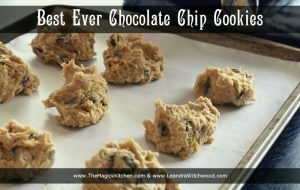 NOW, after nearly 7 years I have people asking me in advance if I will make my biscotti or my chocolate chips cookies this year, and if they can have an extra 6 or so. So I will share with you two of my seasonal favorites. So you too can start your own tradition of tasty gift giving.